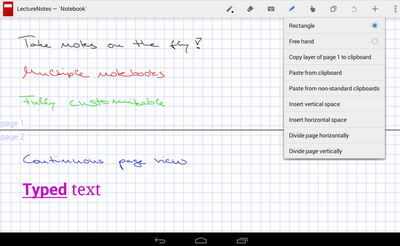 You can now fully dump the paper and turn your Android tablet into a note taking machine. This app can be used to take lecture notes whether you're a teacher or student. It can also be used by other folks such as business people, artists, etc to take notes on the go. 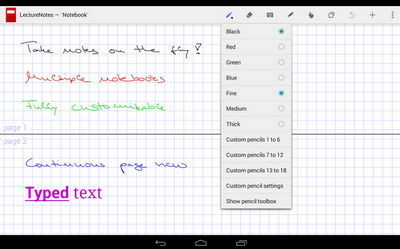 LectureNotes has been optimized for tablets running android 3.0 or later with a stylus. But it is fully functional on phones as well, and you can write with keyboard too. It all depends on your hardware and its features such as pressure sensitivity. If it meets all the requirements, then prepare for some really smooth writing, typing, scrolling, and zooming.